How can you integrate sun protection systems easily and intelligently into Smart Home solutions? And what are the advantages for the user in everyday life? In its new Smart Home Showroom in Bietigheim-Bissingen, GEIGER demonstrates the intelligent cooperation of rolling shutters and Venetian blinds with the GEIGER AIR drives. The smart integrated sun protection not only enhances operating comfort within the connected home but also improves the safety and energy balance of the whole building. The technical components installed in the Smart Home Showroom communicate via a Loxone Miniserver GO. Venetian blinds and rolling shutters are connected to presence detectors, smoke detectors, surveillance cameras and a media server. The GEIGER AIR drives of the sun protection elements are optimally matched to the Smart Home solution of the development partner Loxone. Bidirectional radio and integrated Mesh technology increase the operator safety and the range of electric drives. All products can be controlled via smartphones, tablets or operating switches and can be tested with different options: using GPS data, the sun protection detects the position of the sun and can automatically keep out the heat of summer. 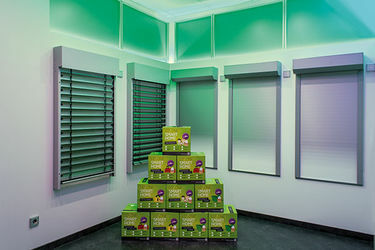 At the push of a button, a daylight dependent lighting control can be called up which connects effectively lighting and sun protection. Alarm situations can also be simulated. For example, if the smoke detector goes off, all sun protection systems move immediately upwards and release the escape routes.